I'm working on my 2nd project - an Ohio Star quilt. I've been having a ball with this. Got the little pieces all cut out and started stitching everything together. I quickly assembled one star block - you would have seen that if you caught last week's post. But after that I took an "assembly line" approach and stitched together all the "triangle blocks" first - then assembling them into the star blocks only after all the triangles were done. It all went by pretty fast. Unfortunately once I started assembling the star blocks I realized that I had a problem. The fabric I was working with actually stretches just a little in one direction. I hadn't noticed that as I was making the triangle blocks. But the effect is that it's just about impossible to get the stars assembled so that all the points are lined up perfectly (about half my triangle blocks ended up being pulled "off side" just a little). Had I done 4 "triangles" and then made the second block, I would have caught it early on. But I didn't. I was sick about it and thought briefly about pulling out my seam ripper and doing it all over again. But... dear reader... as you will quickly learn by following me... I'm no perfectionist. Far from it. The truth is that the blocks look just fine even if they aren't perfect. Of course, on my next project I'll know to test elasticity in both directions and I won't be caught by this again. But for now? Well... the purists will no doubt be cringing. I started with the triangles first. 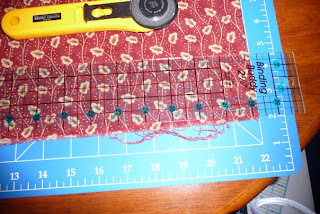 I quickly learned to sew from a flat edge (and not run the point in first) whenever possible. Doing it that way allowed me to move with a certain amount of speed. I stitched the pieces together without clipping the thread between. This created a long chain of triangles and other shapes as I went along, but at least it kept all the bits together. My mother is an artist when it comes to quilting. She's amazing. I’m not sure at what point she started to branch out beyond bed covers, but at some stage she decided to try her hand at other kinds of projects, such as wall hangings. That’s when she came across a pattern for this quilt. Everyone who sees it laughs – including me. The chickens (and the little green worm at the lower left corner) are appliqué pieces which she placed and then machine stitched (zigzag). The chickens’ eyes are embroidered (satin stitch). 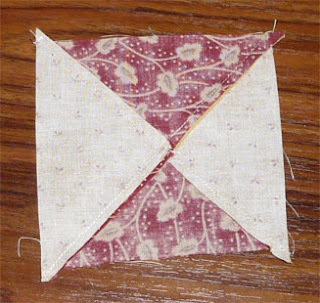 In the 4 corners of the border are tiny blocks with triangles – those tiny blocks just about drove Mom mad – she said she thought she’d go blind stitching them together and getting the edges and points to line up correctly. After finishing it, she gave it to me as a surprise one Christmas many years ago. Of course I liked it immediately – but was a bit concerned about where to hang it. It’s pretty large and tends to dominate the room. It spent some time on my office wall when I lived in Ohio – but after immigrating to Australia (and buying a much smaller house) I just didn’t have a good place to put it, and sadly it stayed packed away in a closet for nearly 3 years. 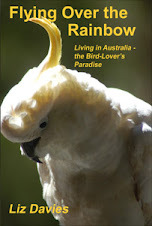 My husband and I live in bushfire country – and after the Black Saturday bushfires in 2009 we realized we needed a safe place to run to when the fire danger is high enough to make staying in our village unwise. My mother-in-law kindly allowed us to take over her spare bedroom and fix it up as our “safe haven”. We installed a bed for us and cages for our parrots (who we would, of course, take with us on fire danger days). 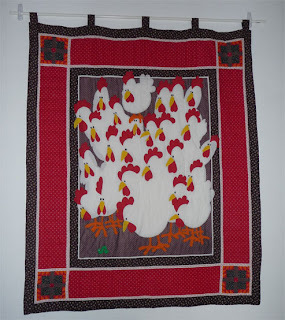 The room hadn’t been painted for quite a while, so we put a fresh coat of white paint there and it occurred to me that the “Chicken Quilt” would look great there – and so that’s where it hangs today, delighting my mother-in-law and friends who visit her. It was the chicken quilt that inspired me to try my own hand at quilting. I wanted a bedspread to go in the room and didn’t find anything that I liked in the shops. The idea of making a quilt too compliment the Chicken Quilt seemed the thing to do, and that is why my first quilting project was this queensized bedspread. Last week I found what I was sure is a "bug" in the software program "Quilt Design Wizard" that I bought just a few days before. I found the problem when I designed this 36x36" wall hanging. As you can see, there are 5 pieces in this quilt, with the center one being an "on-point" block. The "...Wizard" told me I'd need 4 7/8 yards. The software vendor provides an email contact on their website, so I sent contacted them and explained the problem. I also sent along a copy of my project file so they could look at it (on the outside chance that I'd done something to cause the error). It places an imaginary rectangle around each patch. It places these rectangles on fabric of the selected width. 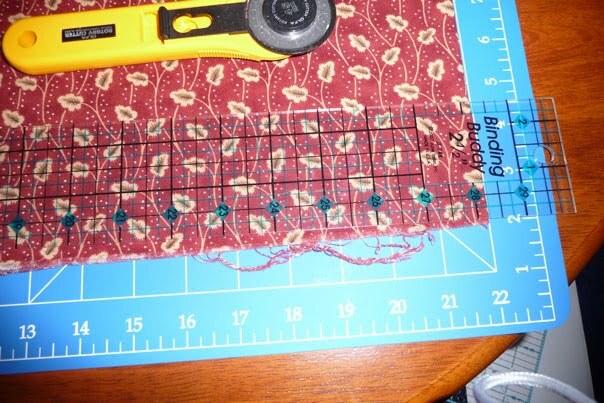 Each time a row is filled, it begins a new row counting the entire strip as required yardage. The result is generally an over estimate of the required yardage. The amount of the overage varies depending on a number of factors. 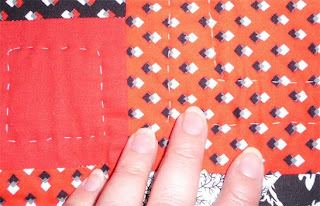 Shapes like on-point lattice strips, for example, tend to give exceptionally large yardage figures, because there is a lot of wasted fabric in the circumscribed rectangles, like the longer diagonal strips in the blocks. For blocks with many small regular pieces, estimates tend to be much more accurate. The estimate for the border is the length of the longest border strip. Interesting. I can see the problem from a programming perspective. They are having to assume a lot of things in this estimate, such as one-way design, and assume that all on-point blocks are cut on the bias (oh... maybe bias-cut squares is what on-point really means? I'll have to research that...). I am still thrilled with this software - even knowing about this problem. When I get around to trying an on-point design, I'll have to take the estimate with a grain of salt. A lesson I learned from my parents is that any job is made easier and more pleasant (not to mention faster) if you have the right tools. At the same time as I bought the fabric for my first project, I spent a little extra and picked up some new tools. First I picked up a rotary cutter and a cutting mat. There weren’t a huge assortment of rotary cutters, but there were quite a few different sized cutting mats. I opted to buy the largest mat available, knowing that I would get good use from it even if I didn’t stick with quilting. 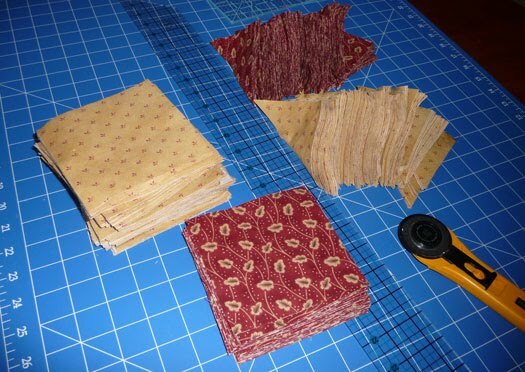 Cutting mats and rotary cutters are useful for all kinds of sewing projects. With them you can cut out a blouse in lightening speed and do it with very little pinning (even around curves and on the bias). With a small cutting mat you really are limited as to what you can use it for; the bigger the better in my view. 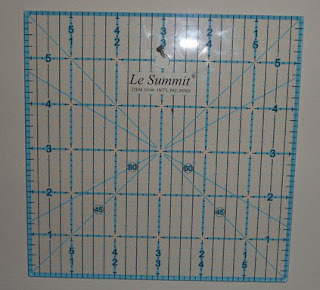 Next I invested in a couple of plastic templates –the photo above is of my a 6 inch square template. I also picked up a long ruler (30 inches long and 2.5 inches wide). They are both made of clear Lucite and make the job of cutting long strips (long ruler) and then squares from those strips (square ruler) a breeze. 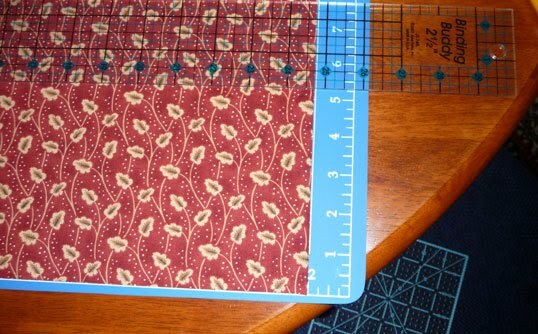 You just lay the ruler on the fabric and line up the measuring lines with the fabric edges and off you go! I also bought a “whatsitfor”. That’s my name for this little greenish Lucite ruler. I paid a visit to a local quilt shop and chatted with one of the owners (a lovely chatty and enthusiastic woman). 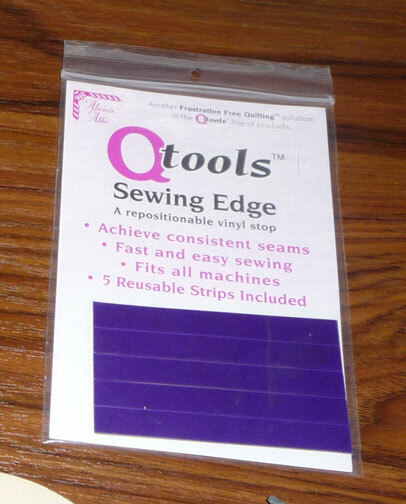 I explained that I am new to quilting and asked her to recommend some tools. She showed me this and explained how to use it – and at the time it seemed like such a brilliant gadget. It’s just the perfect thing for... .uh... I’ve forgotten what it’s for. That’s why I’m calling it a “whatsitfor.” I’m going to have to go back to that shop and sheepishly admit to them that I’m having a “senior moment” over this tool and get them to explain it to me again. The quilt shop clerk also recommended special marking pens and pencils. No trouble remembering what these are for! They will allow me to draw temporary lines on my quilt which I can follow as stitching guides. For my first quilt I just did straight quilt stitches, following the shapes of the blocks. For future projects I will want to experiment with curves, swirls and maybe flower-shaped stitches. 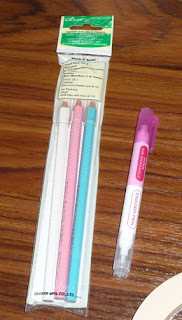 The marking pens will be very useful because I'll be able to draw out a guild on the fabric. Once you are done stitching you can just wipe off the pencil or pen marks with a damp cloth (one is supposed to just brush a way), leaving no trace of the guide lines. 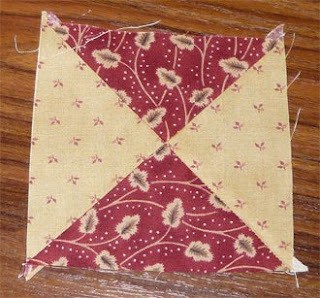 The caution here, of course, is to test the pencil/pen on a scrap before you mark the actual quilt – on the outside chance that the markings might not come off of certain fabrics. And then there’s the guide strips. These are just very thin strips of plastic that you lay on the sewing machine just in front of the pressure foot. 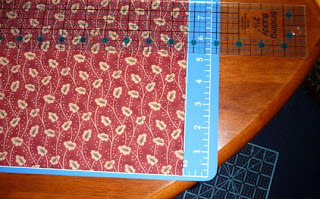 You line them up with the needle so that they show you exactly where to hold the fabric as you sew pieces together – so that your seam allowance comes out at exactly ¼ inch. The strips are super thin, but are also removable, so you can take them off when you don’t need them. I thought this was a great idea, too.... but once I started stitching my quilt pieces together I realized that my sewing machine’s pressure foot actually has a little mark on it at exactly ¼ inch – and I can use that as my visual guide. Still – they’ll come in handy because my machine’s seam allowance markings (for garment-width allowances) are a little hard to see – so I know I’ll get some use from the strips even if I don’t need them for quilts. 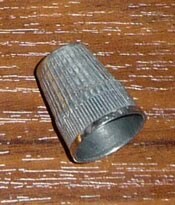 I have never used a thimble – when I sew garments and other projects I just have never needed or wanted one. But I knew quilting would be different. Well.. there are about a bazillion different styles of thimbles out there! I decided to splurge a little and bought a leather one, an “adjustable” leather one (with Velcro tabs), a plastic “bottom hand” thimble and a plain old fashioned metal one. Guess which one I like. Yup. That metal one – the one that cost me all of $1.50. The leather one was unwieldy. The adjustable one never seemed to quite fit correctly. The “bottom hand” one was interesting, but I found that I need to be able to feel the needle with my bottom hand – that’s the only way I’m sure that I’ve pierced through all 3 layers of the quilt “sandwich”. So good old “tinny” perches on the tip of the middle finger of my right hand – and I use it to push the needle after I’ve woven it through the sandwich a couple of times. The fancy thimbles I gave to my friend Pauline (who is an amazingly talented and prolific quilter). Maybe if I get to Pauline’s level of expertise I’ll find that the fancy thimbles make sense. Or maybe not. I suspect Pauline likes the “tinny” ones, too. About a year ago my friend Nerida decided to organize a little informal club with a handful of people she knows and "BAKWACS" was born (Belgrave and Kallista Wine And Cheese Appreciation Society). A small group (9 people - Nerida, Harold, Joan, Nigel, Hanifa, Franz, Sue, Stephen, me) - we meet every couple of months in each other's homes, bring a bottle of wine and some cheese and.. well... appreciate them. There's always a theme, such as "Wines and Cheese of the Yarra Valley" or "Tasmania." Or sometimes an activity, such as touring the wine growing area near where we live and indulging in "tasting." Last week the group drove to River Stone Estate and had a lovely, relaxing lunch there. Nerida had arranged with the winery for us to have a light lunch (an antipasto tray with bread and biscuits). After a bit of "tasting" at the cellar door we selected a white and a red to enjoy with the food. We sat at an outside table and as we waited for the food to arrive, we took in the stunning view of the vineyards and surrounding hills. This was the first BAKWACS meeting I'd attended since I'd started quilting. I had just finished piecing my first "Ohio Star" block and was eager to show it off - so I took it along to "show and tell". To my utter delight I found that Joan and Sue are both quilt enthusiasts! WHO KNEW!?!? "A quilter takes a perfectly good piece of fabric, cuts it up, and then sews it back together." Estimating yardage is not my strong suit. My first project was just simple squares, rectangles and “snowballs” (which are made of squares). Even with something that simple I managed to mess up the yardage calculations and now have a huge pile of leftover calico. That project involved fairly cheap fabrics – but the future projects I have in mind really should be done in better quality fabric. With prices in the area of $20 per meter and up, I really don’t want to over buy and spend myself into the poorhouse. I was sure that there should be computer software out there that helps with this. A quick “Google” revealed an assortment of quilting software. Being new to quilting, I wasn’t sure what features I’d want in a tool – and I was finding prices that range from about $25 to over $200! Then I found a product comparison site with blow-by-blow comparison with 6 different software tools (naturally I didn't save the URL and now I can't find the site... ...don't you hate when that happens?). It was immensely helpful to read this review and get an idea of what the features are and how easy (or difficult) the user interface might be. I have a computer-programming background and have worked with some pretty sophisticated (and difficult-to-learn) tools – but I’m not really interested in having to spend a lot of time reading user manuals. I wanted something straightforward and simple. I finally settled on “Quilt Design Wizard” – a basic no-frills product by “The Electric Quilt Company”. I hunted for a place where I could just buy it online and download it, but apparently downloading isn’t offered. The Electric Quilt Company sells online, but it is a US-based firm, and I’m in Australia. In the US “Quilt Design Wizard” is fairly inexpensive ($29.95) but here the software retails at $42 (maddening! But it seems most things cost more here than in the US). So I found an Australian online retailer and ordered a copy. The disk came and I raced to my PC and loaded it immediately. The install took very little time. When I launched it for the first time I was DELIGHTED to find that the user interface is incredibly easy – very intuitive. I was able to build a quilt design in about 10 minutes! When I designed the Ohio Star quilt (my second project) I did it using Microsoft Visio. It took me about 3 hours to get what I wanted. I recreated the same quilt (actually... more precise than with Visio) with "...Wizard" in about 20 minutes – AND... best of all... once the quilt design is done, you click “print” and get a menu of reports you can have, which includes the yardage calculations! In about an hour I was able to figure out about 80% of the tool’s features. That’s partly because the user interface is so easy – but also because the tool itself is just very basic. After learning the basics via experimentation, I started looking at the video lessons that are built into the software. Now... I’m not the most patient student there is. When someone says “video lessons”... I start gagging. I hate long winded stupid video tutorials that you can’t fast forward through – that ramble on and on, just waste your time. With this tool, though, the tutorials are actually very short – which is GREAT! For impatient people like me it’s not terribly painful to sit through a 90-second tutorial. These lessons are quick “get me in and get me out." The only criticism I have of the tutorial videos is this: the "pause" and "stop" buttons don't work. You can stop or pause the video, though, if you happen to know that a "right click" inside the video window will bring up a menu that gives you control. Now for the bad news. I discovered a problem with the estimator. 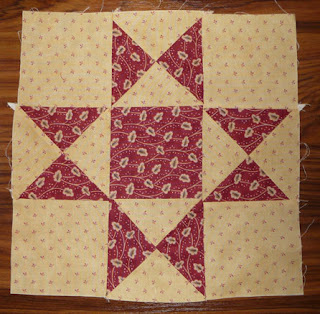 I was showing the tool to a friend and we tossed together a design for a little wall hanging quilt – A simple "on point" log cabin design that would be about 36” square. When we went to look at the estimate for yardage the tool indicated that 9 yards of one colour would be required. Clearly there’s a bug here. I spent some time playing with it and have come to the conclusion that if you start out with a bed-size quilt (king, queen, double, single), the calculations look reasonable. 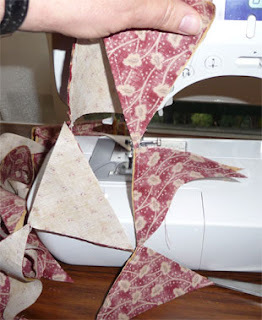 But if you happen to choose “wall hanging” and then use a block pattern that involves diagonally placed (“on point”) blocks – the yardage estimates are off – and dramatically off. I checked the company's webpage for "fix" downloads and didn't find any. Next, just to be absolutely sure, I created another "onpoint" quilt design (this orange one). 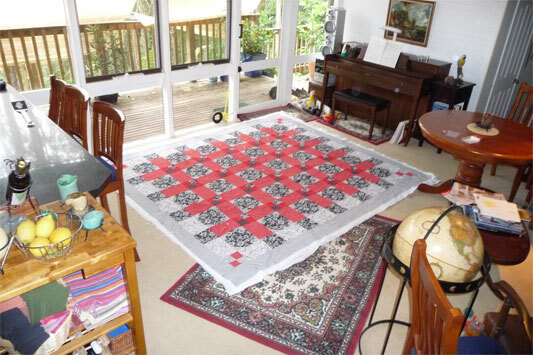 The quilt is 33x33 inches, has 5 pieces and uses one fabric. The estimator tells me I need 4 7/8 yards of fabric. That just can't be right. So I've emailed them and sent them the project file, asking them if this is a known bug and if they have a fix for it (I'm betting that they do). PostScript: After finding this bug I pulled out some quilt magazines and set up 5 duplicate designs in “...Wizard” just to see if the yardage calculations would match those in the magazines. I’m very happy to report that they did, so it looks like the "bug" is confined to "wall hangings" using on-point designs. Today was a waste. Why? Ok... it wasn't a total waste. I spent the day working in the art gallery my church launched about 18 months ago. My day was spent doing my "bit" for church and community. It wasn't a waste. But... now I'm tired, have to fix dinner, and then will be even more tired... so no work on the quilt today. 30 “Ohio Star” blocks. 21 individual pieces per block. 630 pieces without the border strips. I’m over the shock. Well, sort of. I pressed the fabric panels and am ready to go. First thing to do is get a clean, well squared edge to start. 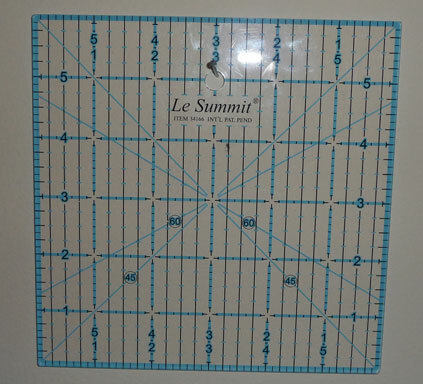 I lay the fabric on the cutting mat and line up the selvage edge with the ruler marks on the mat. Then I lay my clear Lucite “long ruler” on top and line it up with the ruler marks. As you can see, the edge is just a little off – so my first cut is to remove the excess so that I’ve got a perfect 90 degree angle. 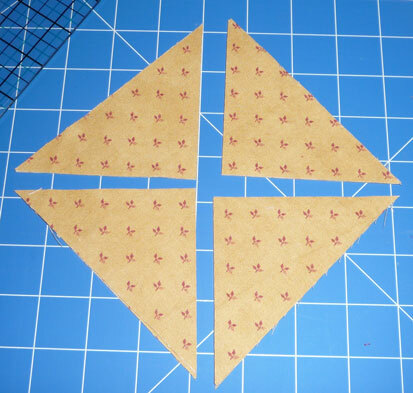 I have to cut blocks at 5 ¼ inches (each of these will be further cut down into 4 triangles) and blocks at 4 ½ inches. I’ll start with the bigger ones. I carefully place the long ruler across the fabric at the 5 ¼ mark (using the markings on the mat). The ruler is long enough to extend over the entire width of the fabric and so I can line the other end up with the mat markings as well. This way I know the ruler is perfectly straight and the cut will be at a precise 90 degree angle. I grab the rotary cutter and.. zip! My first strip is cut. Each strip will give me eight 5 ¼ blocks – so I am able to calculate how many strips I need in order to get the 60 blocks I want. And so it goes. Measure, cut, measure. 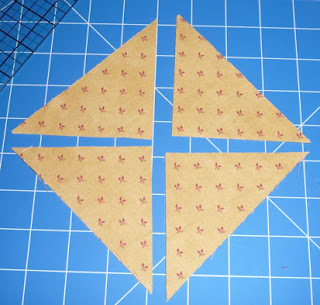 One thing that I noticed early on is that although this process is simple (and somewhat repetitive) it’s actually easy to get distracted and end up cutting strips either too wide or too narrow. So I cut “templates” of the exact block size from paper, and disciplined myself to double check the measurement with the template each time before cutting. More than once I caught myself about to make a goof – and so the little extra effort to double check paid off. After all the blocks are cut, I pick up the 5 ¼ ones and cut them into triangles. 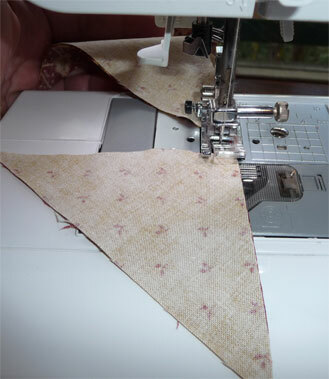 The sharp razor edge of the rotary cutter makes this go by pretty fast because I can chop 6 at a time (more than that and the fabric scoots around while I’m cutting, causing the triangles to be uneven). It took about 2 hours to cut. How long will it take to stitch the pieces into star blocks? Probably eons. 4 combo squares made up of 4 triangles (2 gold, 2 maroon) and measuring 4.5"
120 combo squares - which means 480 triangles (240 gold, 240 maroon)! I'm originally from Ohio, so I thought it would be nice to use the block pattern "Ohio Star" in my next design. The star block pattern I know as Ohio Star is actually known by several other names as well. I did some research to try and discover how it came to be named but wasn't able to find out much about the history of this pattern. I only know it's been around quite a while, and there are many examples of it found in museums (such as this one: Antique Ohio Star). 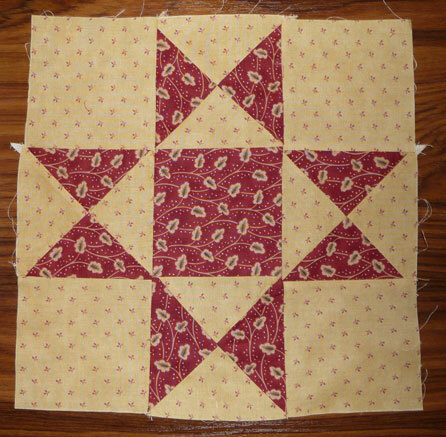 This design features thirty 12" Ohio Star blocks, separated by 2" edges (using the background fabric). Then alternating border strips of the gold and maroon fabrics, with a maroon binding. Now to calculate the yardage needed. I am absolutely embarrassed by the amount of leftover fabric from my first project - as I grossly over-estimated what would be required. I really didn't want to make that same mistake. I also wanted to go with better fabric this time. For that first project I paid about $12 a meter for the fabric. That sounds like a lot of money, but the fact is that fabric just wasn't top quality. I knew that this time I'd be paying between $20-25 per meter. At those prices you really don't want a lot of waste. But - and here's the sticky thing - you don't want to buy too little, and then end up stuck when you go back for more fabric and find that it's been sold out. Both fabrics are manufactured by Moda. the gold is "Garden Party" by Blackbird Designs for Moda (Pattern # 2655) 43" wide. the maroon is Civil War Homefront by Barbara Brackman for Moda (Pattern #8155 "Poke Salad" 140-1865) 43" wide. Both prints have a marvelous "rich" feel to them. I bought enough to get the stars made and the first border (gold). 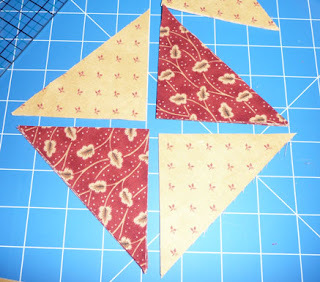 I decided to postpone buying the remaining border and binding fabric until I've finished the star blocks. If the shop doesn't have these prints when I'm ready to buy the rest it won't matter. They have such a huge selection that I'm really not worried about finding something suitable. As soon as I got home I threw the material into the washer and then the dryer to pre-shrink and wash out any sizing. So the pre-washing is done and the panels are neatly pressed. Ready now to start cutting! It's big and it's splashy. Colors loud enough to wake you up at night. 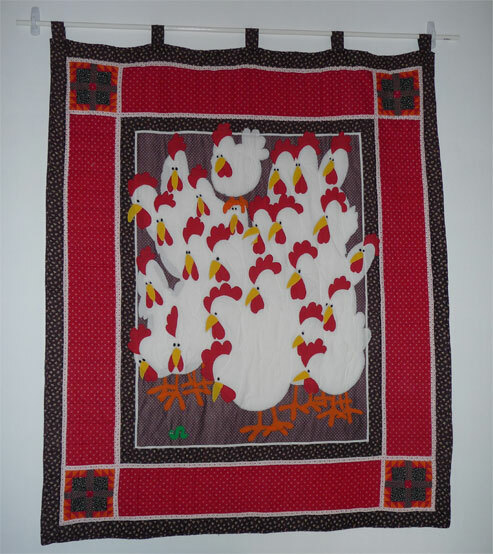 I designed it to go with the "Chicken Quilt" (which my mother made for me decades ago). 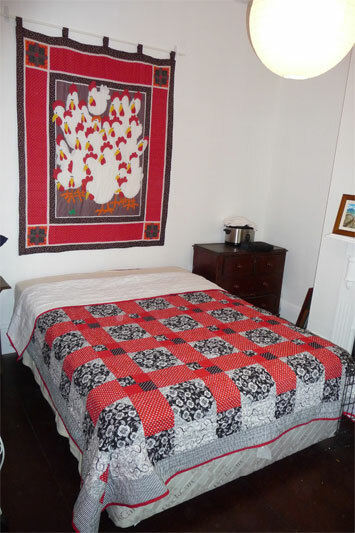 That quilt now hangs on the wall in my MIL's spare bedroom (more about it later). The design uses "snowballs" - a square with corner triangles that make it look somewhat round. Snowball blocks are remarkably easy, so they were a good "first pattern" for me. 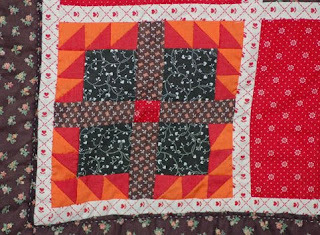 If you've never made a quilt, you might wonder how the layers are assembled. For this project, I spread the backing on the floor (had to move furniture for this...) then rolled out the batting on top of that and finally the top. Then I crawled around on it, using 200 safety pins (starting in the middle and then working outward) to pull the 3 layers together. My stitches are fat and sloppy - not the lovely, even perfection of my mother's quilts. 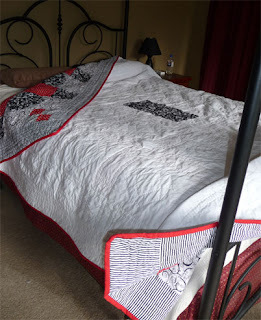 Her quilts are works of art. Mine? Well.. it looks like it was stitched by an 8-year old. But I don't care. The joy of making it was so great that it doesn't matter if it's not perfect. It's functional and that's all I really required of this first project. In the photo above the 2 red blocks don't appear to match. That's due to the camera and flash, as the fabrics do match beautifully. Quilt lovers always want to see the reverse side, so here you are. But wait! What's that in the middle? Well... I'm really bad at estimating yardage. On this project I bought way too much of the top fabric - but for the backing I managed to come up short - so I grabbed a scrap of the black and inserted it. Looks awful, doesn't it? I should have at least used a white background print. Now that it's done it reminds me of a cigarrette burn. 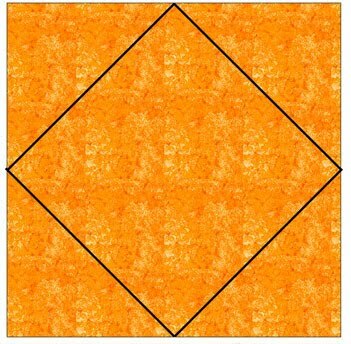 A sympathetic friend suggested that I make this center "splat" my "signature feature" and do that in every quilt. Her idea was it would make it easy to spot a "Liz Davies Quilt". Well, she's right about it making my quilts distinctive, but I don't think I'll be repeating this particular "feature". Upon ending this project last week I discovered a mistake that I'd made - one that I will never make again: not having another quilt project ready to start. Sure, I had scraps and a few bits and pieces, but I hadn't actually thought through the next design, let alone having enough fabric to actually start a new one. To make matters worse, I finished this first quilt just before Easter weekend - and so once I had my next design I found my favorite fabric stores were closed for the holiday (many stores here in Australia close for Good Friday and Easter Sunday). I've learned my lesson. From here out I vow to have overlapping projects so I need never deal with withdrawal again. Quilting. Mom shoulda warned me. She really shoulda. It's a hobby, a craft, an art (sometimes? ), and I'm learning it's also an addiction. 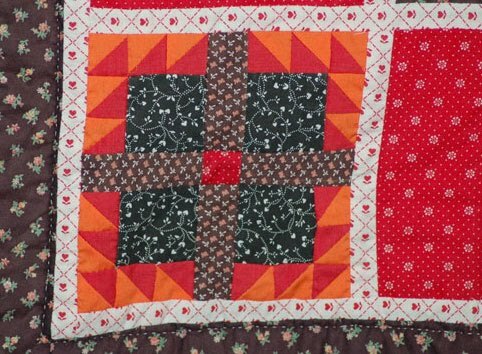 You see... if you have the "quilt gene" (and I'm definitely a carrier), you cannot simply sit down with a threaded needle and sew for a few minutes. No. It's this "thing" that takes over your life. You start with that needle and a sandwich of fabric, batting, and backing fabric. You think you are in control. You tell yourself "I'll just do this one block." And then you start. Needle pushed down thru the sandwich, then up, then down and up again. You pull the thread thru - ahhhhhh - you push the needle down again. Next thing you know, you've been at it for a couple of hours. Your hands are cramped, your neck is stiff, your fingertips are sore (even bleeding) but can you stop? No. I'm new to this. I've sewn my whole life, but never attempted quilting until two months ago. Then for some God-knows-why reason I decided that I wanted to make a quilt. Not just a little lap quilt. Not a sensible "first project" like a small pillow top. No. Let's dive into the deep end of the pool on the first go and do a queen-size bedspread. I looked at quilting websites, read up on the basics and then went out and bought WAY TOO MUCH FABRIC (estimating yardage is not my strong suit). I had a ball selecting the pattern, the fabric. Cutting the pieces was even more fun - and so was stitching them together to make the quilt top. Next came pinning the top to the batting and backing material (making the "quilt sandwich"). I loved it all and suddenly worried that I'd find the actual "quilting" part of the work a boring deathmarch. But it wasn't. I loved it. I loved every minute of it. So now I'm hooked. 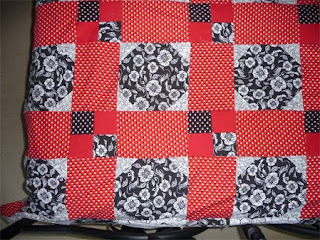 I'm a bonafide junkie and quilting is my "drug of choice." My mother started quilting at about the age I am now (50's). I watched her turn into an addict; she's made hundreds of quilts. I've heard from 2 cousins (her nieces) that they also are hooked. Yes - I'm sure it's genetic. 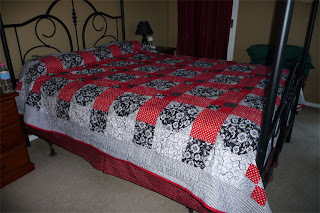 A predisposition for women in the family to quilting addiction. Mom shoulda warned me. She really shoulda.